In our anniversary year 2017 there were three particularly lucrative package deals for you: the CHEER Packages! "All-round carefree packages", each containing the most popular accessories and making your decision easy! In addition, you save quite some money compared to buying separately. NOW WE EXTEND THE RANGE AND THE RUNTIME! All dates 2018 are online! 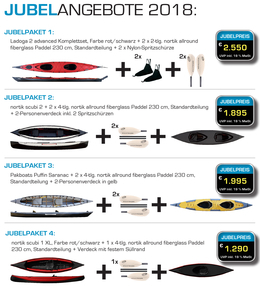 Another model extends the nortik Packraft range: The CityRaft! The nortik CityRaft has among other things been designed for use in urban areas. The focus is much more ondirection stability instead of the otherwise desired agility in the stream. The ingenious system of seating position and integrated skeg ensures relaxed and directionally stable paddling - no matter whether on standing waters such as a lake or on the waterways in Amsterdam, Stockholm, Hamburg or Venice. To experience exciting adventures you don't have to go on a Greenland expedition. Even in your neighbourhood you can escape from everyday life. With so-called microadventures, the adventure on your doorstep - or at least in railway distance! All you need is a sleeping bag and a mat. And in case of need, a stove or a thermos jug for your morning coffee! Then there is even enough space left in or on your backpack for a packraft. An ultra-light inflatable boat, with which you can paddle back the way you came. Trekrafting is the name of this type of microadventure and is just one of the countless possibilities you have with such a packraft. Here it is shown very nicely that with a nortik TrekRaft even with a 9 to 5 job in a large city you have no excuse not to go on an after work "expedition" . We are very pleased that we can celebrate our 15th anniversary together with you this year. In 2017, we will therefore be launching a special edition of the Ladoga 2 advanced and have put together some attractive CHEER-offers for you. For 15 years now, we have been concentrating on exactly one thing: folding boats. 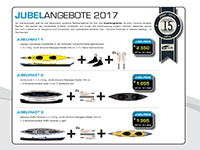 In the meantime, our former "garage company" has become the market leader in the segment of folding and hybrid boats. If you like, read the story behind it here. This is unique: Just in time for our 15th anniversary, we are presenting the Ladoga 2 advanced, a long-running bestseller in a completely new colour combination - strictly limited! As usual, we deliver the multiple test winner as a complete set with backpack, deck, rudder system, installed keel strips, repair set, deck lining and much more! While stocks last! With many of our folding boats you will find assembly videos - always to the right of the product description. We have created a YouTube channel especially for the videos. There you will always find all the latest assembly films. Please click here to go to the YouTube channel (new window). We would be pleased if you subscribed to our channel and you will always be informed automatically about new entries! Shorter, more compact, lighter and cheaper. The little brother of our fold 4.2 is about to be launched. With a length of 3,80 m he plays in the league of the "short single" and is a boat for the extended evening after work or the spontaneous paddling day without big luggage. Fast assembly, strong design and the unique combination of material and the innovative origami-style folding mechanism make the small fold a real specialty!